Each year the Museum researches and creates a new annual exhibit focusing on some aspect of ski history. 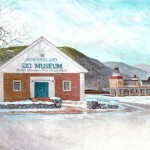 Exhibits from previous years can be seen at the Museum’s satellite locations, which are presently located at Bretton Woods Mountain Resort and the Intervale Scenic Vista on Route 16 several miles north of North Conway. New Hampshire was the epicenter of American skiing from the 1930s into the 1950s when the focus shifted west to higher mountains and deeper, more consistent snowfall. Skiing first became popular as a sport and recreation in the late nineteenth and early twentieth centuries in northern Europe, notably the Scandinavian countries, Germany, and Austria. As the new sport crossed the Atlantic, it became established in and around the northeastern port cities of New York and Boston, which had hinterlands noted for hills and mountains, snowy winters, resorts, and established transportation networks. Due largely to its proximity to Boston, New Hampshire rose to an early, though brief, prominence as a site for recreational skiing in the United States. The state’s influential role was due as well to the passionate interests of three distinct groups: the Scandinavian working class immigrants who flooded into the Berlin paper mills in the late 1800s; the Dartmouth Outing Club students who became enamored of the sport in the 1910s and 1920s; and the generally older, more staid membership of the Boston-based Appalachian Mountain Club. As a result of these positive influences, New Hampshire became established as a skiing hub by the early 1930s, just as the popularity of the new sport was beginning to escalate. Downhill skiing techniques, developed in Europe by professional ski instructors, such as Hannes Schneider, were popular in the teens and twenties, and Dartmouth followed closely new skiing developments on the Continent. Many who learned skiing in college outing clubs kept up the activity as they moved into a variety of careers, becoming advocates for the sport. Owners of summer inns in the White Mountains and elsewhere quickly saw the potential for a winter season; state agencies also foresaw future revenue and mounted publicity campaigns. By the time World War II brought the development of downhill skiing to a temporary halt, most elements of the modern ski industry had arrived in New Hampshire, many of them for the first time in this country. New Hampshire can fairly profess to be the first American location where these aspects of the sport were seen: down-mountain trails cut specifically for skiing; new developments in downhill racing; overhead wire-rope ski tows; an aerial tramway and other innovative conveyances for skiers; professional ski patrols; a systematic method of ski-slope grooming; the first professional ski school; the concept of Alpine-style ski villages and associated sales of real estate; the profession of ski resort planning; and governmental ski-lift safety board and skier statutes. Taken together, these elements combined to form the structure of an entirely new tourism industry. In the winter of 1967 two new ski areas opened in central New Hampshire, in Waterville Valley and at Loon Mountain in Lincoln. Geographically close, separated only by the Mount Osceola range, the two resorts were connected by similarities, differentiated by contrasts, and together represented a high water mark of sorts for ski development in the Granite State. By the time Waterville Valley and Loon Mountain, adjacent to the new Interstate 93 highway, began operating, New Hampshire had lost its early lead to Vermont and western states. The creation of these two large resorts in the White Mountains came at a time when skiing was growing rapidly and new areas were being built throughout New England. That growth rate would slow within five to seven years, and economic headwinds would force many smaller areas to cease operations. Several major ski areas were constructed after the 1967 debut of Loon and Waterville, notably Bretton Woods and Jackson Ski Touring, but the heyday had passed and in retrospect the birth of the twin areas on either side of Mount Osceola represented a crest of ski area development in the state. Bretton Woods Mountain Resort has been host to a Ski Museum exhibit in recent years. Located in the ground floor of the Bretton Woods base lodge, the exhibit usually consists of about fifty photographs and text drawn from the annual exhibits seen at the Ski Museum. A single chair from the 1940 Mount Mansfield chair lift, once the world’s longest, is also on display here. In the annals of New England skiing, the state of Maine was both a leader and a laggard. The first historical reference to the use of skis in the region dates back to 1871 in New Sweden, where a colony of Swedish immigrants had been induced to settle in the untamed reaches of northern Aroostook County. The first booklet to offer instruction in skiing to appear in the United States was printed in 1905 by the Theo A. Johnsen Company of Portland. Despite these early glimmers of skiing awareness, when the sport began its ascendancy to popularity in the 1930s, the state’s likeliest venues were more distant, and public land ownership less widespread than was the case in the neighboring states of New Hampshire and Vermont, and ski area development in those states was consequently greater. Only in the 1950s did the construction of alpine ski sites become commonplace in Maine, many of them conceived as economic development initiatives. From 1950 until the mid-1970s ski areas sprouted all over the state, until ski area creation slowed nationwide. Maine’s relatively late start allowed its ski area builders to benefit from the expertise of ski resort planners like Sel Hannah and the Sno-engineering firm, and permitted its state government to enact environmental legislation before overdevelopment marked the landscape as it had elsewhere. Numbered among Maine’s distinctive impacts on skiing are far-ranging Nordic marathons; inventions and improvements in snow grooming tractors and implements; a unique university program that trained students for varied careers in the ski business; and the organizational and financial know-how one ski area owner employed to create an assemblage of ski areas on a national scale. The Maine ski exhibit consists of some 60 photographs and artwork with text and captions drawn from the collections of New England Ski Museum, with the considerable assistance provided by members and directors of the Ski Museum of Maine. The Maine exhibit will be on display at New England Ski Museum until early June 2016. The history of skiing in New Hampshire’s Mount Washington Valley is the subject of a traveling photographic exhibit located in the Intervale Scenic Vista Visitor Center on Routes 16 and 302 several miles north of North Conway village, where there is a sweeping view of Mount Washington over the alluvial plain of the Saco River. The skiing history of the region is rich, and it can be argued that Jackson and North Conway were the first towns in the US where a ski business arose. Beginning in 1936, professional ski instruction and a pioneering ski tow were available in Jackson, and with the opening of a comprehensive resort at Mount Cranmore in 1938, it became the first mechanized American ski area located in a populated village, a combination that favored further ski industry developments. The exhibit begins with a grainy image of three female skiers taken at the Eagle Mountain House in Jackson in 1887, and concludes with a photograph dating from the early 1970s of cross-country skiers in the same location. In the intervening years several unique contributions to skiing originated in the Eastern Slope Region, as the area was known in the decades before the 1960s. The first overhead cable ski tow of original design in the country was installed at what is now Black Mountain in the winter of 1936; the first (and with one exception, the only) Skimobile lift came to Cranmore in 1938; the first systematic ski area grooming in the country was performed at Cranmore in the early 1940s; and the first state ski lift safety board was chaired by Phil Robertson, a North Conway man. Two further unique features of the area’s ski history are the residence of master ski teacher Hannes Schneider beginning in 1939, and the looming presence of Mount Washington’s Tuckerman Ravine, a natural snow collector where skiers can find snow well into the springtime. Schneider, who devised a system of ski technique and instruction in Austria and was considered by many to be the father of modern skiing, relocated to North Conway prior to World War II after being forced out of his native land by political turmoil. It was one of Schneider’s Austrian protégés, Toni Matt, who captured the imagination of the skiing world when he schussed (ran straight) the Headwall of Tuckerman Ravine in 1939. The steep slopes and precipitous gullies of Tuckerman were not all skied until the early 1950s, when Brooks Dodge of Jackson made a concerted effort to descend them all.